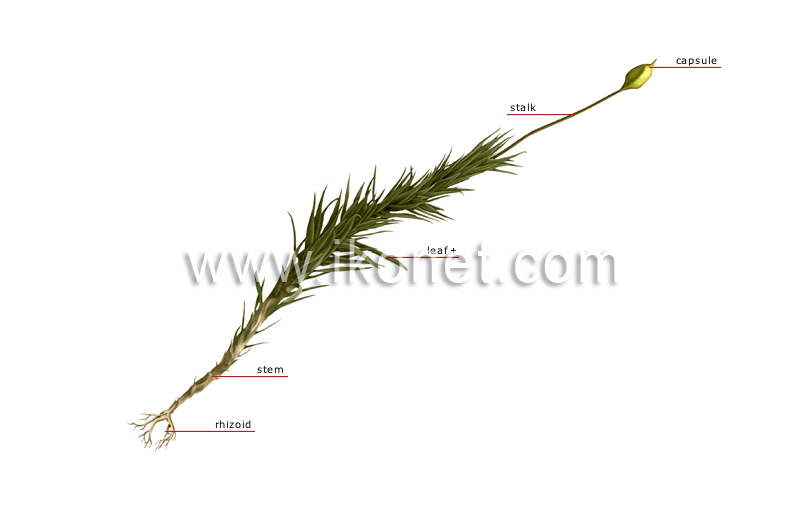 Long slender axis that supports the capsule, enabling it to absorb nutrients. Hollow structure that manufactures spores, small seeds used in reproduction; it has a cover that opens to release the mature spores. Rootlike filament enabling the moss to anchor itself to its substrate and absorb water and mineral salts. Main part of the moss from which the leaves spiral outward; it can be upright or flat. Part of the moss originating at the stem, especially adapted to capture light, perform photosynthesis and absorb water.